The Industrial Outlook Survey conducted during January-March 2016 (Round 731), provides qualitative assessment of business situation of companies in the Indian manufacturing sector for Q4:2015-16 and their expectations for the ensuing quarter Q1:2016-17. The survey elicited response from 1,342 manufacturing companies. Survey indicated moderate increase in optimism for production, order books, financial situation and salary for Q4:2015-16 as compared with Q3:2015-16. However sentiments on other indicators, vis. exports, imports, employments, profit margin and overall business situation deteriorated. 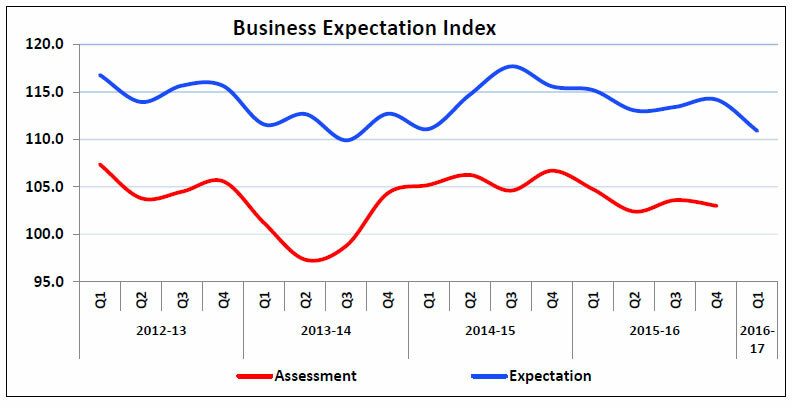 As a result, the business sentiments of the Indian manufacturing sector, as inferred from the Business Expectation Index (BEI), witnessed slight moderation. The outlook on business sentiments shows moderate optimism for Q1:2016-17. The BEI dipped from 114.2 (for Q4:2015-16) to 110.9 (for Q1:2016-17). Moderation in the business sentiments is seen in all business indicators barring pending orders, salary and overall financial situation. ‘Increase’ in production is optimistic. @:Due to rounding off percentage may not add up to 100. This is applicable for all the tables from 1 to 17. #: Net Response (NR) is the difference of percentage of the respondents reporting optimism and that reporting pessimism. The range is -100 to 100. Any value greater than zero indicates expansion and any value less than zero indicates contraction. ‘Increase’ in order books is optimistic. Pending orders ‘Below Normal’ is optimistic. ‘Increase’ in capacity utilisation is optimistic. ‘Increase’ in exports is optimistic. ‘Increase’ in imports is optimistic. Inventory of raw material and finished goods ‘Below average’ is optimistic. ‘Increase’ in employment is optimistic. ‘Better’ overall financial situation is optimistic. ‘Increase’ in working capital finance is optimistic. ‘Improvement’ in availability of finance is optimistic. Decrease’ in cost of finance is optimistic. ‘Decrease’ in cost of raw material is optimistic. ‘Increase’ in selling price is optimistic. ‘Increase’ in profit margin is optimistic. ‘Better’ Overall Business Situation is optimistic. ‘Increase in Salary / other remuneration’ is optimistic. 1The 72nd round (Q3:2015-16) survey results were released on January 15, 2016 on the RBI website. The survey results are those of the respondents and are not necessarily shared by the Reserve Bank of India. 2Net Response (NR) is the difference of percentage of the respondents reporting optimism and that reporting pessimism. The range is -100 to 100. Any value greater than zero indicates expansion/optimism and any value less than zero indicates contraction/pessimism i.e., NR = (I – D); where, I is the percentage response of ‘Increase/optimism’, and D is the percentage response of ‘Decrease/pessimism’ and E is the percentage response as ‘no change/Equal’; I+D+E=100. For example, increase in production is optimism whereas decrease in cost of raw material is optimism. 3The Business Expectation Index (BEI) is a composite indicator calculated as weighted (share of GVA of different industry group) net response of nine business indicators. The nine indicators considered for computation of BEI are: (1) overall business situation, (2) production, (3) order books, (4) inventory of raw material, (5) inventory of finished goods, (6) profit margin, (7) employment, (8) exports and (9) capacity utilisation. It gives a single snapshot of business outlook in every quarter. BEI lies between 0 to 200, and 100 is the threshold separating expansion from contraction.